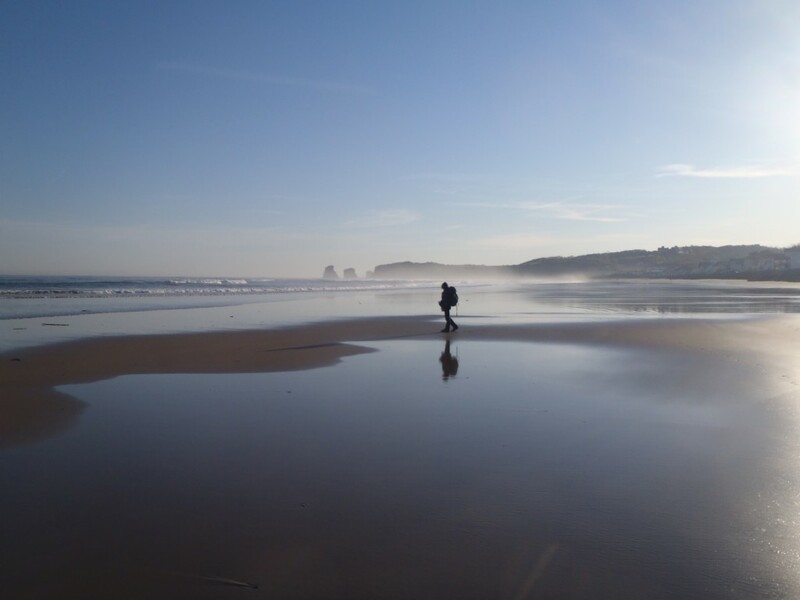 For this first week of the Great Pyrenean Traverse we are on the GR10, starting with a dip in the Atlantic Ocean at Hendaye Beach (a lovely place to spend a night or two prior to the trek - cross the river on the ferry for lunch in Hondarribia). 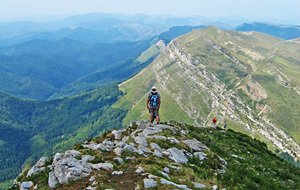 From Hendaye we climb gradually above the ocean to the first foothills and summits of the beautiful Basques country. We finish the week arriving in the heart of the Iraty Forest, the largest beech forest in Europe. Date: June-Sept 2019 for groups of 4P+. Price: 1110€pp, seven nights full board accommodation in hostels and refuges, seven days guided walking. Or 170€ for each day/night you spend with the group. Contact: Sian. Day One (28 July): Meet in Hendaye early in the morning to start our trek that same day. After a quick dip in the ocean for those who wish we start our trek directly from Hendaye beach. Heading in a south-easterly direction, we climb several low passes before reaching Olhette and our hostel for the night. +788m, -703m, 22kms, ~6h walking. To join or leave: 5km taxi to Urrugne, bus to St Jean de Luz. Day Two (29 July): From Olhette we climb up for a beautiful view from the 'Col des Trois Fontaines' before dropping back down to Ainhoa for the night. +636m, -563m, 20kms, ~6h walking. 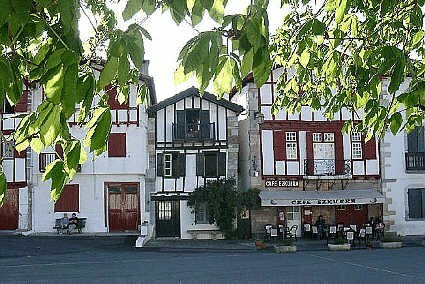 To join or leave: Taxi 12kms to/from Cambo-les-Bains, train to Bayonne or St Jean Pied de Port. Day Three (30 July): We leave Ainhoa, climb over several passes, in order to reach the charming village of Bidarray. +670m, -646m, 21kms, ~6h30 walking. To join or leave: train from Pont Noblia to Bayonne. Day Four (31 July): Today is a more challenging day but with great views along the border ridge of Crete d'Iparla. We arrive in St Etienne de Baigorry where we spend the night. +894m, -882m, 15kms, ~7h30 walking. To join or leave: bus to St Jean Pied de Port, train to Bayonne. Day Five (1 Aug): Today is an easier walk and we finally arrive in the famous Basque town of St Jean Pied de Port, where the GR10/High Route, the Way of St James from the north and the foothill path coming from the east all meet. +505m, -510m, 17kms, ~6h walking. To join or leave: train to Bayonne. Day Six (2 Aug): Leaving St Jean we head to Phagalcette. +814m, -396m, 20kms, ~5h walking. 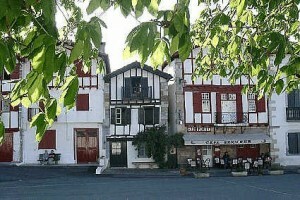 To join or leave: taxi to St Jean Pied de Port, train to Bayonne. Day Seven (3 Aug): From Phagalcette to Iraty we have a big climb to take in the mythical Pic d'Orhy, the first 2000m summit coming from the west. We spend the night in the Iraty chalets. +1579m, -727m, 18kms, ~7h30 walking. Day Eight (4 Aug): Group transfer to St Jean Pied de Port to connect with the train to Bayonne. To book you can use the on-line booking system below - select the start date and the end date and then proceed. The system will ask for a deposit which you pay using PayPal. Or, if you prefer, you can email us directly (sian@pyrenees-mountains.com), ring directly on +33 5 62 92 81 52 or Skype at sian.grigg. Deposit payment is possible via direct wire transfer. Ask us for our IBAN details.